By default, all Qwilr Pages have metadata that tells search engines "ignore me". However, sometimes you want a page to be searchable, it's great for marketing brochures and sales material. This is an optional setting that you'll enable on a per page basis. 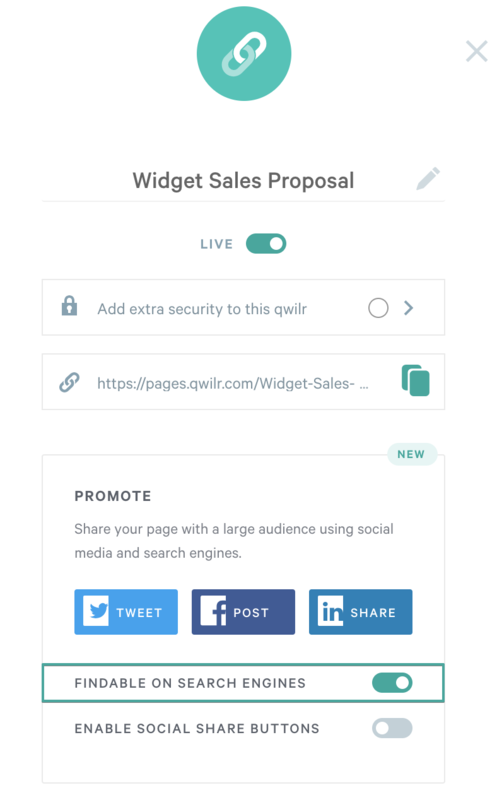 To turn this on, click on the Sharing button for the Qwilr Page you'd like to be found. This can be found on the Dashboard to the right of the Qwilr Page's name or in the header of the page when editing the Qwilr Page. From there, enable the switch labeled "Findable on search engines" and then the Qwilr Page will be searchable by any search engine. To make the Qwilr Page completely private again, click the switch to disable it.